In Robert Maxon’s welcome book, Majimbo in Kenya’s Past: Federalism in the 1940s and 1950s, losers come front and center. The author does not focus on the leading lights of the settler community, also part of the losing side in the narrative of Kenya’s decolonization. This is not a book about Lord Delamere, Michael Blundell, Wilfred Havelock, Ferdinand Cavendish-Bentinck, and Humphrey Slade, powerful, wealthy, and influential members of Kenya white settler community, though they appear from time to time. Center stage belongs to individuals who have scarcely made their appearance in the story of Britain’s departure from Kenya in 1963. Here, the leading lights are A.T. Culwick, B.F. Roberts, and L.E. Vigar, racists, profoundly against Africans and Asians alike, and robust federalists in defense of European privilege right up to the bitter end. … After discussing the Dawe’s plan, presented to the Colonial Office in 1942 and calling for a grant of self-government to Kenya’s settlers in the White Highlands, Maxon discusses the majimbo plans put forward in the 1950s. … This is a work of impressive and careful scholarship. One looks forward to Professor Maxon’s further volumes on Kenya’s constitutional history. The following are excerpts from her chapter “Collectionism and Colonialism: The Africana Collection at Brazil’s National Museum (Rio de Janeiro)” in the book African Heritage and Memories of Slavery in Brazil and the South Atlantic World edited by Ana Lucia Araujo, which help preserve the memory of this beloved institution. “The most significant acquisitions of African artifacts were made during the administrations of Ladislau Netto and Roquette Pinto. Later on, Heloísa Torres gave more emphasis and resources to artifacts representing the legacy of the African presence in Brazil. But these three vibrant researchers shared a common interest not just in anthropology but also in the dynamism of cultural manifestations that transcended the sharply defined models of Western postslave society. They gave importance and prestige to the most diverse forms African-derived objects. Africana contains important individual pieces, but what stands out in the collection are sets of related objects that, for their antiquity or rarity, deserve special attention. The great majority of the pieces were obtained through private donation, or exchange with other museums, whereas some other items were purchased. In the Sector of Ethnology and Ethnography (hereafter SEE) registry, African artifacts are listed in sequence numbers with their date of acquisition, along with all the other artifacts in the ethnographic archive. The oldest artifacts that have been identified and historically contextualized are the group of presents sent by King Adandozan of Dahomey to Prince Dom João in 1810, including the aforementioned throne. Other objects described by Graham would be equally important, but these were apparently lost. “There are also many objects labeled as African but acquired in Brazil, which are difficult to identify properly. Such is the case of cloths purchased by Heloísa Torres in Bahia, registered as African. One of them, acquired in 1953, belonged to the wife of a Mr. Tibúrcio, member of the Brotherhood of Rosário, a Catholic lay organization for African descendants in the coastal city of Salvador. Another group of objects had been apprehended by the court police from a so-called ‘fortune-telling house,’ as the headquarters of Afro-Brazilian religious groups were known in imperial, nineteenth-century Rio de Janeiro. The police would regularly invade these ‘cult houses’ in search of what they considered suspicious and confiscate objects at hand as proof of the practice of witchcraft. In one such case, a list of apprehended items was sent to the National Museum bearing the title ‘List of diverse objects encountered in fortune-telling houses, rendered by the police, whose chief was the distinguished Mr. Serafim Muniz Barreto, to the court.’ Among the listed objects were some items that would have come from Africa alongside others made in Brazil by Africans and African descendants in their religious and quotidian pursuits. African Heritage and Memories of Slavery in Brazil and the South Atlantic World was published in 2015. A 25% discount is available for the hardcover version (enter coupon code SAVE25 at checkout). There are also e-book versions starting from $8.99. Mariza de Carvalho Soares is a Brazilian historian working on slavery, the African diaspora, and African history. She is a researcher at the CNPq/MCT (Brazilian national endowment agency). Since 2012, she has been the curator of the African collection at Museu Nacional (Rio de Janeiro, Brazil) and director of the research project Africana do Museu Nacional (2013–2015) funded by FAPERJ (Rio de Janeiro state endowment agency). In recent years, she has been a research fellow at Vanderbilt University, Yale University, Stanford University, the University of Chicago, and the École des Hautes Études en Sciences Sociales. She is the author of numerous chapters and articles and the author and editor of several books, including People of Faith: Slavery and African Catholics in Eighteenth-Century Rio de Janeiro (2011), which received the Roberto Reis Book Award from the Brazilian Studies Association. Ana Lucia Araujo is a Professor of History at Howard University. In addition to having published several single-authored monographs and edited volumes, Professor Araujo has edited special issues of the journals Luso-Brazilian Review and Journal of African Diaspora Archaeology and Heritage and published articles in several journals, including Slavery and Abolition, the Luso-Brazilian Review, Ethnologie Française, Ethnologies, Varia História, Lusotopie, Tempo, and the Canadian Journal of Latin America and Caribbean Studies. Professor Araujo is the general editor of the Cambria Press book series Slavery: Past and Present. Writing Contemporary Nigeria is a must for all African literature collections–Order it now and click here to ask your university library to purchase it. This book is in the Cambria African Studies Series headed by Toyin Falola (University of Texas at Austin) with Moses Ochonu (Vanderbilt University). 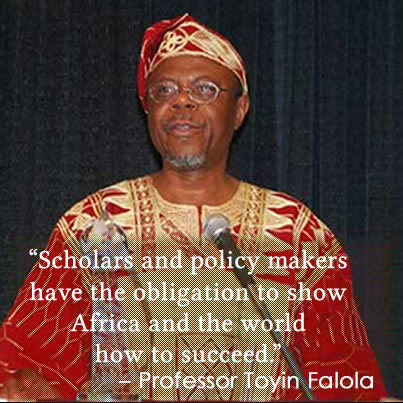 At this year’s African Studies Association (ASA) annual conference, Cambria Press author and general editor of the Cambria African Studies Series, Toyin Falola (the Jacob and Frances Sanger Mossiker Chair in the Humanities and University Distinguished Teaching Professor at the University of Texas at Austin) will deliver his lecture “Emerging Themes in Contemporary African Diaspora Humanities” as president of the African Studies Association. 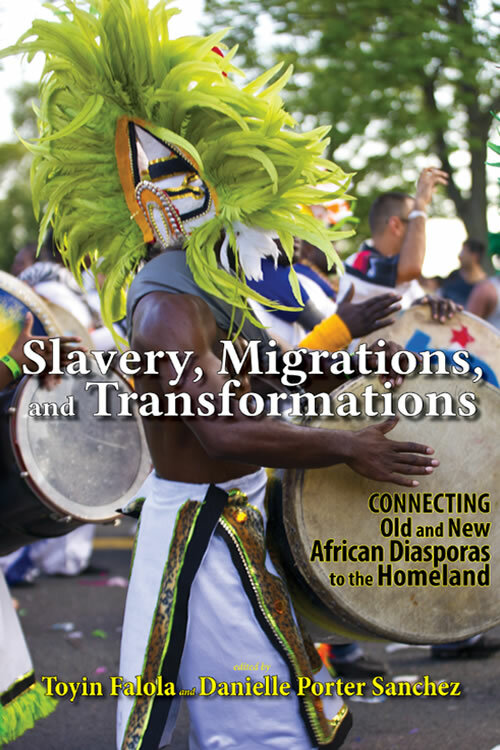 Dr. Falola’s most recent book Slavery, Migrations, and Transformations: Connecting Old and New Diasporas to the Homeland, which he coedited with Danielle Porter Sanchez and is in the Cambria Studies in Slavery Series headed by Dr. Ana Lucia Araujo (Howard University), speaks to this very theme. The book will be on display in the ASA book exhibit hall at the Scholar’s Choice booth. Visit www.cambriapress.com for more information. Transatlantic Memories of Slavery also includes an interview with Kenya Cagle who discusses perspectives on Quentin Tarantino’s Django Unchained and the film’s pop vision of the slave past. 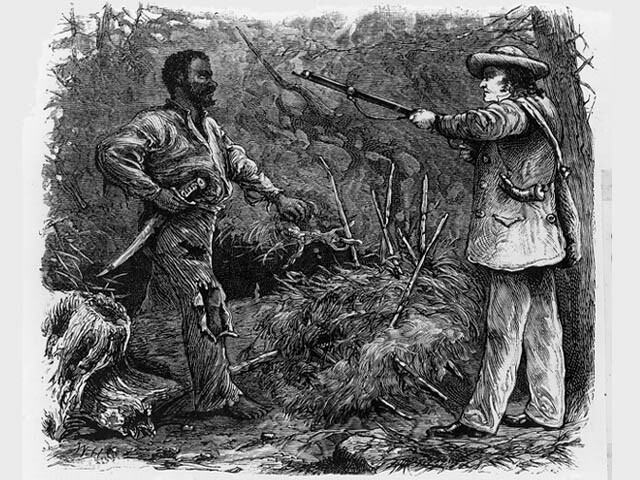 Cagle also talks about this meetings with Nat Turner’s family, including including his great, great, great grandson Bruce L. Turner (who is a historian). This is an important book for for those interested in African American, American, and Latin American studies and working across literature, cinema, visual arts, and public culture. It will also be useful to public official and civil servants interested in the question of slavery and its present memory. Like Cambria Press on Facebook, subscribe to the Cambria Press Youtube channel, followCambria Press on Twitter, and Google+1Cambria Press . #ASALH100: Cambria Press Author & Slavery Series Editor Ana Lucia Araujo will be at the session “Slavery, Public Memory, and Reparations” on Friday at 7 p.m. (Sheraton Atlanta Hotel, 1, Georgia 10) and at the session “From Slavery to Freedom: Black Women in the Americas” on Saturday at 2 p.m. (Sheraton Atlanta Hotel, 2, Savannah 2, Level 2 Lobby). 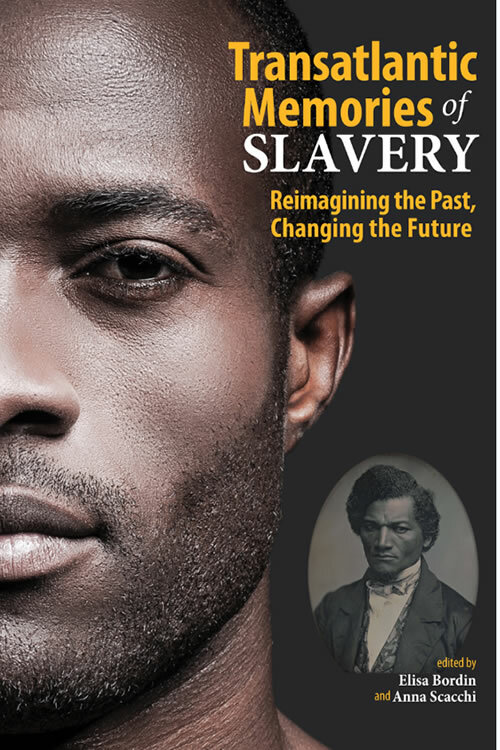 Cambria Press Author & Slavery Series Editor Ana Lucia Araujo (Howard University) will be at two sessions at the centennial meeting and conference of the Association for the Study of African American Life and History (ASALH). + FREE Shipping and Handling! Individuals and libraries can use this code.